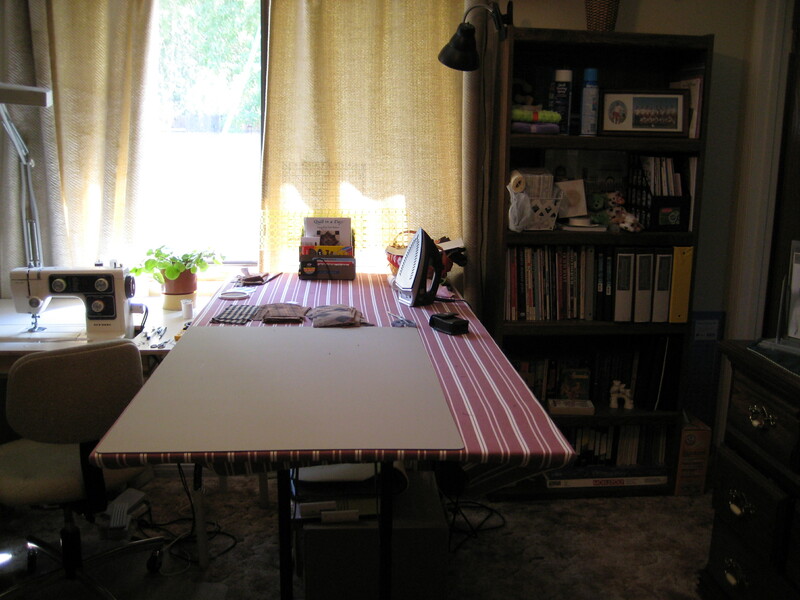 I have a folding cutting table that I'm using now but am going to build myself one with storage on the bottom. My original plan was to use the top from my folding one since it's nice and smooth for pinning but I'm concerned that it will be hard to drill and screw into because it's totally covered in laminate and of course I don't want any screws popping out the top. Plus it's only 1/2" thick which makes it even harder to prevent that. Would you try using it or use something else? If something else, is plywood better or mdf? I'd probably try using it first. After all, that doesn't cost you any additional $$. If you're putting it on top of something else, just make sure you're using the proper length screws. If you are not successful with that and need to purchase something else, I'd probably go with mdf as it's more stable than plywood. I would not use it because it is probably made from either partial board or MDF and with it only 1/2" thick there isn't enough to hold the screws. I used 3/4" Birch. It's a little expensive but it can be sanded, painted, and varnished. You can check by pics for the one my husband and I built. As for storage you can use a smaller base cabinet then the ones we used even a second hand would work. Screw the top to the cabinet and if the top is longer than the cabinet make part of the top a drop-down. I wouldn't use it for the reasons above, plus since it folds it could be a secondary cutting for you. That does sound too thin to drill into and get a sturdy top. I would get 1X3 boards and ask for a permanent bonding glue that they use for cupboards. After the glue dries on the boards under the top, you could drill and screw into the wood pieces and slightly into the top. I would start new ... being that it's a folding table, I wouldn't want to lose it for other possible uses. My husband built me an awesome cutting table. The top is made of 3/4" cabinet grade plywood. I left it unfinished because it helps keep everything in place from fabric to cutting mats. If you wish you can always finish it. I had it for about a year, and I still think unfinished is a way to go. Good luck! My son made me a cutting/ironing table from a 3/4 inch 4x8 board. Used two folding legs from Home Depot. Then I covered it with batting and stripped material and stapled it underneath. I use it for a large ironing board with straight lines from the stripped material. I always wash my material before I cut it, so you need lots of room to iron it after washing. Then I put a large cutting board on one end. The batting is thin enough to make the cutting board very stable. So with the cutting board on one end, you still have enough room at the other end to iron while you are sewing blocks. It is made from 3/4" plywood with a Formica top. And a small bookcase on one end to serve as the "leg" of the cutting table. It is 3' x 5' and 37" tall. It's attached to the wall on two sides and leaves me with storage underneath. Everyone is born right handed, only the gifted overcome it. Thanks everyone! I am building the bottom part because premade cabinets are way too tall (I'm putting it on casters which will raise it another 3.5", plus I'm short). I have tools to build it so that's not a problem. I think painting it is the biggest chore but I'd have to do that no matter what. I think some of y'all are right-too thin to securely screw into. Chasing Hawk-where did you get the formica to put on top of your table? We special ordered it from Lowe's, I think we paid around $50.00 for a 4x8 sheet. The formica was originally suppose to go in the back of my truck. We were going to have specialty slide out trays on the sides of the bed put in for storage. But since it is my truck, we decided not to make them. Thanks. I don't have a lowe's nearby but I'll check with Home Depot. If you can afford it, I would make a whole new table, as large a surface that I have room for and make sure you can fit your cutting mat on it as well as room around it for a place to store all the "stuff" that we gather and use. If you have funds, check out the Ikea web site, they have awesome storage units, and for about what you would pay for the wood. Good luck!! There's no ikea near me, unfortunately, and their shipping is way too high (I tried to order two small carts, about 25lb total and $100, and shipping was $349. No lie). I'm making it 3' x 5'. That's about the limit of the space I have. I will also have a separate 2' x 5' ironing surface that I'm making with an old cabinet (it won't be on casters so I can use a cabinet for it). I am making a whole new underneath part though-I was just going to use the old top. But I think I'll get a new top too. I'm actually thinking of driving to an Ikea soon. It's about 2.5 hours away. But I wouldn't be able to fit a big table like that in my car along with the other items I want to buy. ...Chasing Hawk-where did you get the formica to put on top of your table? i also used a sheet of laminate... i ordered it through the net and it came loosely rolled in a large box. having said that, i was at home depot a couple of days ago and they had 4x8 sheets in the same section that they sell the preformed countertops. i know menards also carries it the same way. i use two dressers back to back and made a heavy countertop of mdf with the sheet laminate on that. the top is heavy and does not need to be screwed down, so it can be easily moved. Mine is topped with white melamine and I love it! Easy to keep clean and to need to paint it like plywood. Home Depot has a 4x8 sheet of white, smooth topped material in their wood section (about 1/4 inch thick). Just glue it to the top of the 3/4 inch wood. Oh good idea. I've seen those-like pegboard without the holes. I think it's called tempered masonite or tempered hardboard. Industrial-strength velcro! 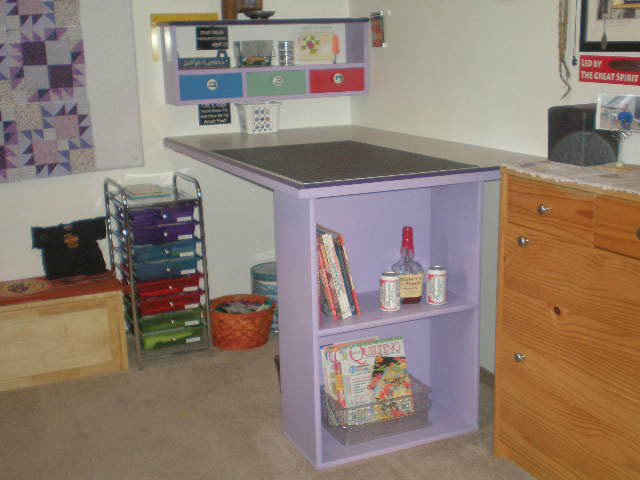 I used it to attach 3/4" thick plywood to cubicle shelf units to make a cutting table and a sewing table. 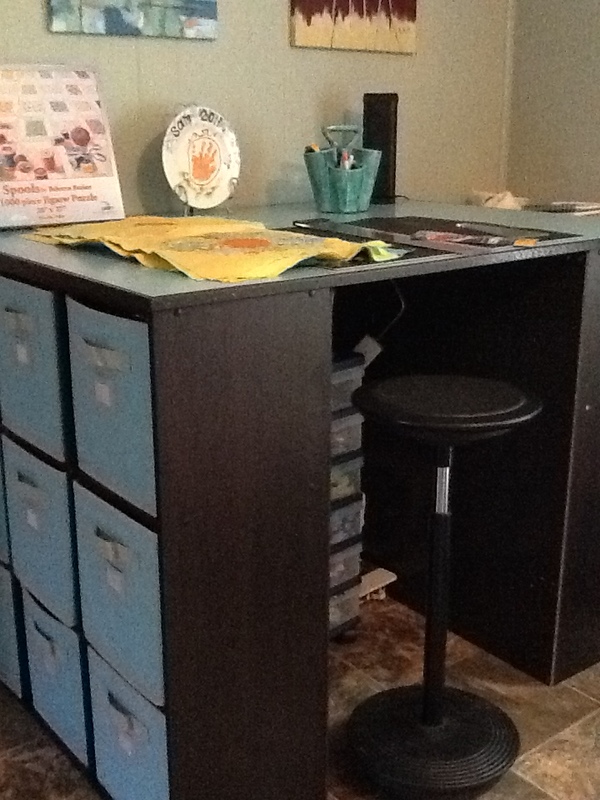 One table top is 3'x5' and the other is 3'x4" and with the velcro, they are interchangable.